The most rebellious thing about me is that I have a tattoo of three pink roses on my lower-back. (Well, they were pink! I just noticed that they’re kind of starting to fade now that it has been 10 years!) It’s kind of funny to me that this is known as a “tramp stamp” since I was a virgin when I got married! Oh, and I have three piercings in one ear and only two in the other! I know, try not to fall out of your chair! Seriously, ask my parents – aside from my sassy mouth at 12-years-old, I was a pretty low maintenance child. I’m hoping that karma works in my favor, but I have a feeling that my second daughter isn’t going to make life easy on me! When I’m not working, taking care of my two young girls, cooking, cleaning, grocery shopping, etc., I’m usually checking out coupon match-ups and organizing shopping trips. I’m not even close to being “extreme,” although I have had some moments of majorly stocking up on some great deals. 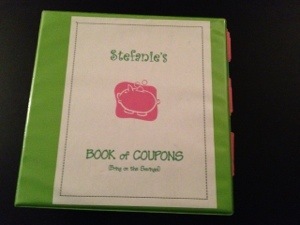 I consider myself to be more of a “strategic” coupon-user. More to come on this in the future. Stay tuned! When I’m not doing any of the steps in #2, I’m probably watching Notre Dame Football or Basketball or catching up on a favorite TV series with my husband! We really need to get out of the house more often on some dates, but we’re totally happy reclining side-by-side on our black leather love seat in our Notre Dame-decorated basement! Yes, we are a little obsessed! 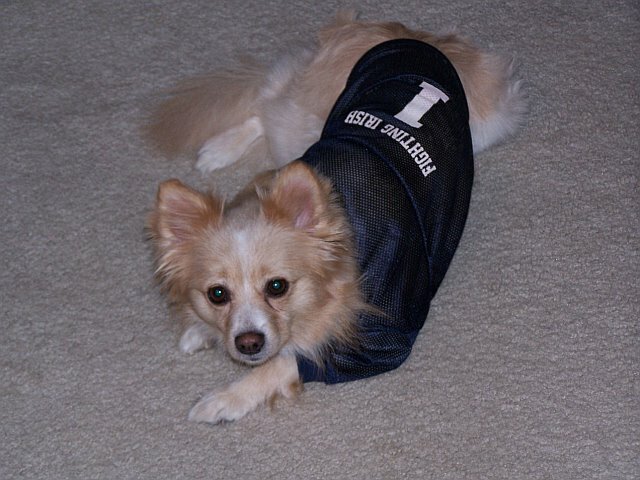 Even our dog, Princess, has a jersey! You can take the girl out of Indiana, but you can’t take Indiana out of the girl! Northern Indiana will always feel like home to me, even though I have lived in Tennessee for nearly eight years now. When I talk, I never know what accent is going to come out of my mouth! I have a lot of family in Michigan, I went to college with a bunch of people from Chicago, and now I’m surrounded by southern drawls! I’m some kind of a Midwest meets the mid-south hybrid! Speaking of college, I really regret that I did not minor in Spanish! I took 4 1/2 years of Spanish in junior high and high school and wanted to continue to advance, but my advisor told me that the Spanish professor wasn’t that good, so I didn’t take any courses! Shortly after, a new professor took over, but by that time I had already decided to major in Human Services and Social Work and minor in Psychology and Criminal Justice. There was no room in my schedule to squeeze in any Spanish when I was on track to graduate in three years, so I could get married and move to Nashville! I need to break out the Rosetta Stone again! 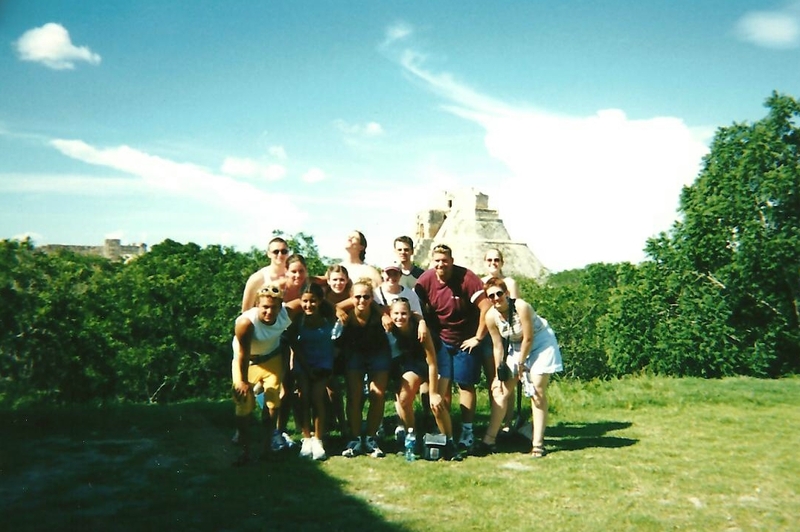 It is definitely on my bucket list to become more proficient in Spanish! I’m planning to expand the focus of my blog a little bit. Since pursuing dreams usually requires money, I’m planning to start some kind of series that includes cheap, easy recipes, money-saving tips, inexpensive activities, etc. I’m thinking about calling it, Keep Your Change! I come across so many useful ideas that I should probably share them! I guess I have put this off a little bit because there are so… many great blogs out there that focus on all of these topics in depth on a regular basis, but, oh well! I’m going for it! I’m also going to dive back into a project that I started at the end of last year! I can’t wait to share it, because it’s going to take what I love to talk about – dreams and doing God’s will – to a whole different level! 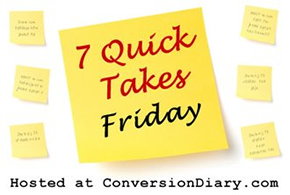 Read more 7 Quick Takes posts over at Conversion Diary! Have a great weekend, everyone! All of your new features in the pipeline sound so exciting; I can’t wait to see them! I love Spanish, too–I took it all through high school and majored in college, but in the few years since I’ve graduated, I haven’t had many opportunities to use the language. I miss it so much! Thanks! That’s so awesome that you majored in Spanish! I’m jealous! There are some times where I could definitely use it working in the social services field! Fun to learn more! I need to do this too. I was kind of hesitant to talk about myself, but it was fun to throw all that stuff together! Wow, we do have a lot in common! You were totally right. 🙂 Just from reading today’s quick takes I can already see many parallels. For example: I grew up in Indiana…and I laughed at your accent explanation. I was born in Wisconsin, mainly grew up in Indiana, went to school with lots of Chicagoans, and now I live in Michigan. People get really confused about my “accent” because it’s some Midwestern hybrid of Wisconsin, Chicago, and plain old Indiana. I can relate to your #1, too, because I had a nose piercing and some people probably thought I was so edgy…but I was always a very clean cut girl, haha. Oh and me encanta el Espanol tambien! Too funny! Yeah, when I read your “about” page, I was like this girl is kind of like my blogging twin! Haha!